Follow Alice down the rabbit hole on a whimsical and delightful culinary journey at The Mad Hatter Restaurant & Tea House! 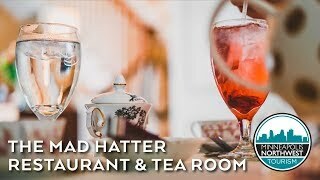 Located in Anoka's historic Woodbury House, built in 1857 and beautifully situated on the Rum River, The Mad Hatter offers a truly unique dining experience with its fabulous high tea services, along with a scrumptious brunch menu, Tuesday through Sunday. As you dine, surrounded by eccentric clocks, regal crowns, amusing hats, and hurried rabbits, you will feel like you have absolutely joined the infamous tea party in Wonderland! Schedule an unforgettable tea party at The Mad Hatter! For tea services, guests can choose from three options: Queen of Hearts Tea, Cheshire Dessert Tea, and Children's Tea. Queen of Hearts is the most popular tea service and includes an assortment of traditional English cream and lemon blueberry scones served with lemon curd and blueberry lemon lavender jam, savories including classic cucumber tea sandwiches and The Mad Hatter Signature Chicken Salad on a cranberry muffin; desserts such as double chocolate buttercream cupcakes, pistachio orange tartlettes and the Queen of Hearts Jam Tart; plus, unlimited hot tea. For the sweet tooth, there's the Cheshire Dessert Tea, a sweets-only tea service featuring the same delicious medley of scones and desserts as the Queen of Hearts, also with unlimited hot tea. For the little ones, ten and under, the Children's Tea Service offers a selection of sandwiches, sweets and more, including fancy milk and cookies, cucumber finger sandwiches, jam and cream cheese finger sandwiches, Princess Applesauce with fresh berries and Scrumptious Cupcakes with whip cream and a cherry on top! When it comes to tea, there is no shortage of great options! Choose from The Mad Hatter's classic teas: Mad Hatter House Blend Black Tea, Coconut Almond Black Tea, French Crème Brûlée Black Tea, Royal Wedding Black Tea, Divine Temple Green Tea (our personal favorite featuring pineapple, mango, orange, papaya, strawberry, apricot and cherry! ), and Seasonal Punch Rooibos Tea. Depending on your desire for caffeine, you can select from a hodgepodge of caffeinated black loose leaf tea (flavors include bourbon chocolate, candy cane, rose marzipan and more), mildly caffeinated green loose leaf tea (cherry rose, lemon meringue pie, maple walnut, vanilla mint and watermelon lime), and decaffeinated herbal loose leaf tea (piña colada, raspberry patch, root beer and vanilla cream). Looking for a great brunch? Choose from many delectable sweet and savory options on The Mad Hatter's one-of-a-kind brunch menu! If you're a French toast fanatic and are looking for an indulgent treat, you must try The Mad Hatter's stuffed French toast. Choose from pulled pork stuffed French toast, filled with caramelized apples and onions, whole grain mustard, cheddar and cream cheese, topped with pulled pork and maple dijon ale syrup; or the pumpkin cream cheese stuffed French toast on apple fritter bread, filled with house-made pumpkin cream cheese and topped with whipped cream and candied pecans. What's a brunch without eggs?! The Mad Hatter offers a plethora of egg dishes from traditional Eggs Benedict and quiches to skillets and its signature Tweedle Puffs. If you're looking for a more classic option, we recommend the Queen's Scramble - soft scrambled eggs with chevre, burst cherry tomatoes and fresh herbs, served with a side of ham, savory scone and hollandaise; or a quiche with plentiful options including the corn cob smoked ham, apple, tarragon and smoked gouda quiche; the spinach, artichoke, heirloom tomato and mozzarella quiche; or the broccoli, wild rice and cheddar quiche. For a signature Mad Hatter egg experience, choose from the Crab Cake Tweedle Puff - herbed crab cake, poached egg, sautéed greens and house-made hollandaise sauce inside pâte á choux pastry puff, or the Magic Mushroom Tweedle Puff - pesto scrambled eggs, sautéed greens, wild mushrooms, brie cheese and house-made hollandaise sauce inside pâte á choux pastry puff. Tweedle Puffs are served with a choice of soup, honey-lavender dressed greens, brunch potatoes, sweet potato frites or grits. You can't go wrong with any of these options! If lunch is more up your alley, you can devour a variety of tasty sandwiches and burgers! Choose from the Mad Hatter Original Chicken Salad (a staple since 1999!) - cranberry pecan chicken salad, secret Mad Hatter spice, served on choice of croissant or cranberry wild rice; or the Green Goddess Grilled Cheese - filled with avocado, basil, artisan greens, pesto, havarti and chevre on sourdough with a side of green goddess dressing (with the option to add on bacon and/or turkey for an additional fee.) If an enticing burger is more your style, try the Thai Turkey Burger, topped with Thai slaw (pickled apple, heirloom carrot, sweet peppers, red onion, pineapple, cilantro and sesame dressing), or the Mushroom Brie Burger, served with Certified Angus Beef®, wild mushroom, caramelized onion, brie cheese, and a side of sweet onion jam. And don't forget the classic brunch favorite: Chicken & Waffles! Nothing says brunch like southern buttermilk fried chicken fillets on a Belgian waffle with maple-dijon dressed artisan greens and candied pecans. For entrees bursting with uncommon flavors from afar, savor the Cajun Shrimp & Grits - bacon cheddar loaded grits topped with Cajun-spiced shrimp and scallions; Swedish Meatballs with pappardelle pasta and lingonberry jam; or the Pierogis & Kielbasa - potato and cheese pierogi, kielbasa, caramelized onion, sauerkraut, and whole grain mustard. Lighter fare and gluten-free options include an array of salads, such as the Roasted Beet Salad - red and gold roasted beets, pickled apple, heirloom carrots, goat cheese, candied pecans and honey-lavender vinaigrette, or the Thai Sesame Salad - artisan greens, cucumber, red onion, heirloom carrot, cilantro, wonton strips, sesame seed, and Thai sesame dressing. Add grilled chicken breast or shrimp or house-made crab cakes to any salad, for an additional fee. Bonus Tip: If you come to The Mad Hatter for brunch on a Saturday or Sunday, you can enjoy some exclusive creations only available on the weekend – Fresh Baked Colossal Cinnamon Rolls made with cream cheese icing and big enough to share; or biscuits and gravy – savory scones smothered in rich country sausage gravy (with the option to add two eggs any style, for a fee). When it comes time for dessert, you are faced with a serious dilemma! Choose wisely from The Mad Hatter's rich collection of treats, including Milk Chocolate Croissant Bread Pudding made with Callebaut® finest Belgian chocolate (supports sustainably grown cocoa! ), buttery croissants, brandied cherries and sweet cream; Flourless Chocolate Torte (a gluten-free option! ); and our personal favorite, a Gigantic Slice of Celebration Cake, white cake layered with lemon curd and berry jam with buttercream frosting. Just one slice of this remarkable cake, perfect for birthdays, anniversaries, congratulations, and all occasions, serves four people easily! For a bigger celebration, a whole cake that serve 8-12 people can be ordered by calling ahead to reserve. Bring the whole family for an unforgettable brunch with a children's menu for kids ten and under. Your little ones will love all the yummy options and fancy milk and cookies! Can't get enough of The Mad Hatter's signature teas? Stop in its gift shop, located upstairs, where you can purchase The Mad Hatter's tried and true favorite tea flavors, along with a variety of black, green and herbal loose tea, scone mixes and plenty of whimsical décor and accessories, perfect for your next tea party! And if you're looking for something fun to do, check out The Mad Hatter's never-ending list of special events! Annual occasions include the Kentucky Derby Lawn Party, Daddy/Daughter Tea, Annual Mother's Day Tea, Valentine's Dinner and Christmas Tea. Past and potential future events include the Royal Wedding Cocktail Party, Etiquette with Alice, Brews & BBQ, Snow Queen Tea Party, Sprinkles the Elf Christmas Tea Party, Wanda Witch's Halloween Tea Party, Murder Mystery Party and Superhero Tea Party. For more info on these special events, visit: https://www.madhatteranoka.com/events. The Mad Hatter is a great spot to host your next private event. The unique space is perfect for bridal showers, baby showers, retirement parties, birthdays and more. Choose from the Queen of Hearts Tea Party or Alice's Garden Party. The staff at The Mad Hatter prepare the most amazingly fabulous tea party for you and your guests. Tables are set with ivory linens and an eclectic variety of china, fresh flowers and beautiful glass candle tea warmers and fancy sugar cubes with gold tongs, an extra table for guests to set gifts, a card box, photos, etc., plus custom menus with your Guest of Honor's name(s) and the date of your special occasion. For more info on hosting an event at The Mad Hatter, visit: https://www.madhatteranoka.com/private-tea-party/. 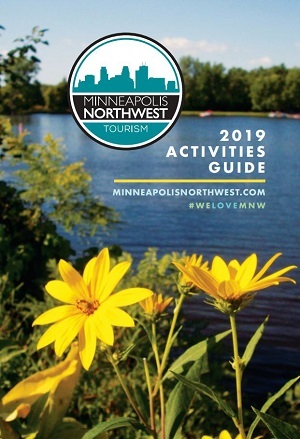 Tuesday through Friday - 11 a.m. to 4 p.m.
Saturday and Sunday - 10 a.m. to 4:30 p.m.